This week Peter Brooker and I discuss Yaphet Kotto’s villainous but fun wardrobe in Live and Let Die, both as Dr. Kananga and as Mr. Big. You can read more about a few of Kananga’s outfits coverd on this blog here, including this week’s post on his tan suit. 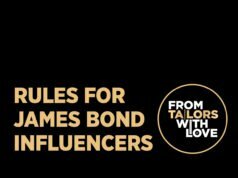 Before we discuss the iconic villain’s wardrobe, Pete mentions a Bond 25 news tips he got and tells us where to sign up if you want to be an extra in Bond 25. 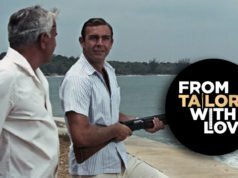 We also talk about some Bond memorabilia that are up for auction at Ewbank’s and Tom Ford’s new ready-to-wear season. 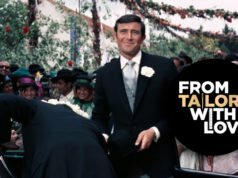 I attempt to answer listener mail from Mike from Chicago about what kind of hat a modern James Bond would wear a suit and overcoat, since a felt trilby can look outdated today. We don’t come to a proper conclusion. What kind of hat do you think Daniel Craig’s Bond would pair with his overcoats? The rather hideous looking red patterned shirt in the photo above looks like the work of Frank Foster too from the placket stitching. Yes, that’s mentioned on the podcast. Interesting question about the hat. I remember it being asked recently Matt and your reply was that it wouldn’t really suit Craig’s version of Bond, especially as a secret agent he’s supposed to blend in and these days most brimmed hats are going to draw attention. There are exceptions, especially if undercover disguises are needed. Craig wore a peaked cap when he posed as a chauffeur in Skyfall and a top hat with his skeletal costume in Spectre. Vesper’s one-eyed stalker in Venice wore a panama IIRC and didn’t stick out. There are possible environments when today’s Bond could get away with a hat, maybe again a panama in a hot location? I agree that the right panama hat could suit Craig. Notice that they haven’t put Bond in middle America since Goldfinger if I’m remembering correctly. I think one of the reasons for this was that in order to blend in, he’d have to wear some pretty un-Bondian outfits to say the least. Forget a chauffeur’s peaked hat, top hat, or a panama…can you imagine Bond in a baseball hat? To say nothing of the rest of the outfit. He was in Vegas in DAF and San Francisco in VTAK. Neither probably qualifies as ‘middle america’ – I’ve been to both and never saw a white dinner jacket in either city, especially not in the daytime. And speaking of ‘fitting in’, they’re finding it harder and harder with each film to provide a context in which Bond’s signature dinner suit can be worn. The last time when he magically produced his ecru Tom Ford for dinner on a train was pushing it to the limit. Maybe in Bond 25 he can pass through middle America en route to dispatching the villain and blag an invitation to a high school prom? Rod – Without a doubt my favorite instant dinner suit was in Quantum Of Solace where Bond breaks into a performer/orchestra musician’s locker backstage at the opera house. Not only does he find a beautiful $4000 Dr. No-influenced Tom Ford ensemble in his preferred midnight blue, in his exact size, but it is also tailored perfectly for his body. Presumably, the Vienna Opera has a bassoon player who could have been played by Daniel Craig in a double role. To paraphrase The Who, “Too much, the Magic Tux”!